Home » Posts tagged "Supply Chain Management for Garments Factory"
Now supply chain management working as a key success factor for the apparel industry. That’s why the core focus of top management is to develop an effective supply chain management system. Supply Chain Management is the process of managing resources, the movement of resources from one party to another, one place to another place, one department to another department, and one section to another section. Here, movement of resources should be in a way so that the availability of the right resources in the right place, at the right time, with adequate quantity, where the process cost is least. 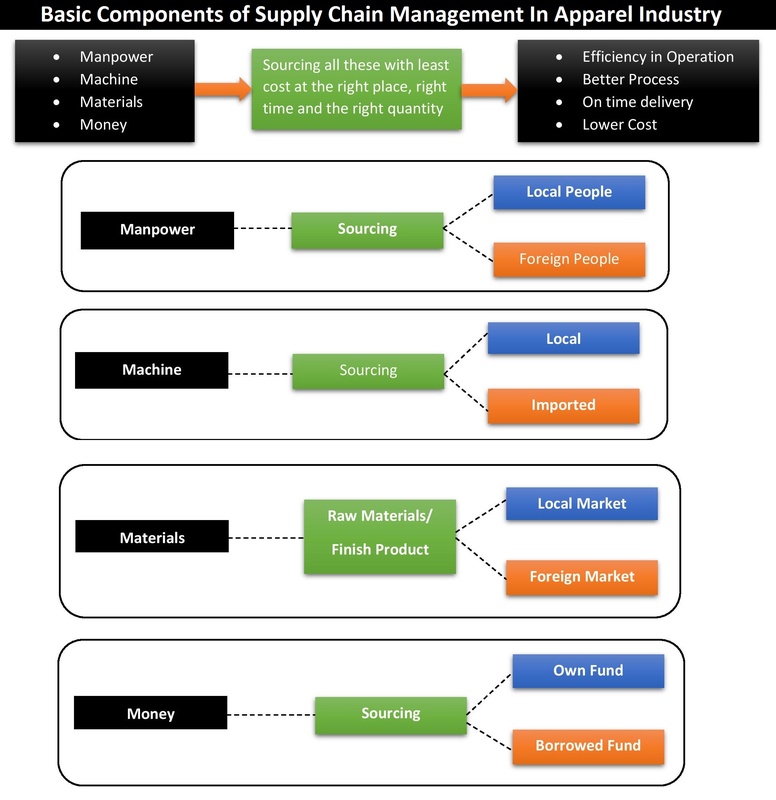 Here in this article, you will have a broad idea of supply chain management in apparel industry and what are the things you need to be careful when you work with Supply Chain Management for Textile and Garments. The important thing is supplying the required resources at a minimum cost. Manage the flow of goods and services through the supply chain network and it is mainly related to logistic. For this reason, logistic planning is one of the key focus. In a supply chain management, the management of resources in every stage of manufacturing. The apparel industry is a vast industry producing millions of garments every day. One of the toughest challenges faced by this industry is increasing the cost of garments making and the price of both local and imported raw materials also increasing. Manufacturers make garments both for local and export market but industrial scale production is for export. You know the export market is highly competitive because China, Bangladesh, Vietnam, India all are fighting for offering a better price to the garments buyers to hold the export share high. You can compete in the market but first of all, you need to minimize your direct and indirect cost associated with your garments production. And the right solution is to use of supply chain management by which optimal sourcing is possible where cost is minimum. And this is the reason why supply chain management is important for the apparel industry. Another thing is, we know about supply chain management but many of us are not sure of how to apply and how to plan for proper supply chain management. Apparel manager should carefully develop their supply chain and they will be successful only if they have a proper planning for supply chain management. Future is very much competitive for garments business. Those who manage Supply Chain (SC) properly will get a competitive advantage over its competitors. It is the right time to hire some Supply Chain Management (SCM) professionals and develop supply chain management for your garment’s factory. You can find the scope of supply chain management in every single place within your garment’s factory. In your factory, you may require to supply, receive of materials from one department to another, one section to another section and one location to another location. So, there must be a proper planning for designing and setup of an effective supply chain management in the apparel industry. Ensure logistics management in terms of both raw materials sourcing and delivery of final product. Supply chain management ensures the right time delivery of product/resources/services to the right place for a minimum cost. Everything is interconnected in an organization, all you need to do is to identify the elements and process, analyze them and plan for a better connection. Always a logical innovation in supply chain management will give you a reward for an efficient business operation which will ultimately lead you to success.